The path to deeper personal connection is curiosity, not commonality. Far too often in conversation we will say or hear someone say, “Oh my god! Me too.” Then, the story or anecdote will follow that loosely relates to what was previously said. Here is an example. “So, when I was in 7th grade, I broke my arm…” she says. “Oh my god! Me too,” he replies. “That’s so crazy!” she says. “I know, right? !” he agrees. This is a natural conversation habit. Most people do this not to “1-UP” or try to impress, but to try and find connection. We are so excited that we have something to contribute to the conversation that we cannot wait to let the person or group know that we have a similar experience. Commonality is fine, but how would that same “broken arm” conversation look when curiosity replaces commonality. “Oh my god! How did it happen?” he asks. “Well, (INSERT INTERESTING STORY),” she explains. “Hmmm… I guess (INSERT PERSPECTIVE GAINED THROUGH DIFFICULT EXPERIENCE),” she says. “Really cool. I also broke my arm in 7th grade,” he shares. “Oh my god! Tell me more about that,” she requests. Situational awareness is an underrated piece of the lifestyle of Social Excellence. Using the context of a situation to drive the content of our conversation is a quick path to a strong connection. Here are two stories, one about a phriend of Phired Up and one personal, that share how situational awareness can lead to meaningful relationships, powerful conversations and just better stories to share with friends. Ian Lowe, Executive Director of Pi Lambda Phi, shared a fascinating story with me recently of how he used situational awareness to turn an ordinary moment into a meaningful relationship (“meaningful” is a sincere understatement). While attending a professional conference, Ian Lowe found himself in an educational session sitting near a stranger. Waiting for the session to start, Ian wanted to talk to this person and was searching for the perfect way to strike up a quality conversation. Did he go with the old-fashioned “Hi, my names is…”? Nope. Did he do the overused name-tag peak and begin asking questions about name, school and position? Not this guy. He used some situational awareness and asked a great question. Noticing the situation, Ian leaned over and said, “Hi. So tell me why you chose this session.” This was the gateway to a great conversation, and this is also the story of how Ian met his fiancee, Christine. Ian and Christine’s story is one full of bold choices, fun memories and sacrifice, but it all started with situational awareness. If you know anything about me, you know I love comedy. If you know anything about comedy, you know that for the better part of three decades, few have done it better than Bill Freakin’ Murray. With a little bit of situational awareness, I was able to meet one of my comedy heroes in a fun, unique way. Flying out of my home in Charleston, SC, I was checking into my Delta flight as I turned and saw Bill Freakin’ Murray (Mr. Freakin’ Murray lives in Charleston when he’s not making movies). He was standing with a younger woman who was either family, a friend or an assistant. Stopping to take notice of the situation, I gathered a few things. She had bags, he did not and their conversation did not seem to be a pleasant one. Perhaps they were discussing a travel delay of hers or some other stressful matter. Situational awareness was telling me this was not the time to walk over, stick my hand out and say, “I’m a huge fan.” I had to think fast, because passing up on this chance would become a huge regret of mine. Then I remembered my ticket to a great conversation. In my backpack, I had an issue of GQ magazine. 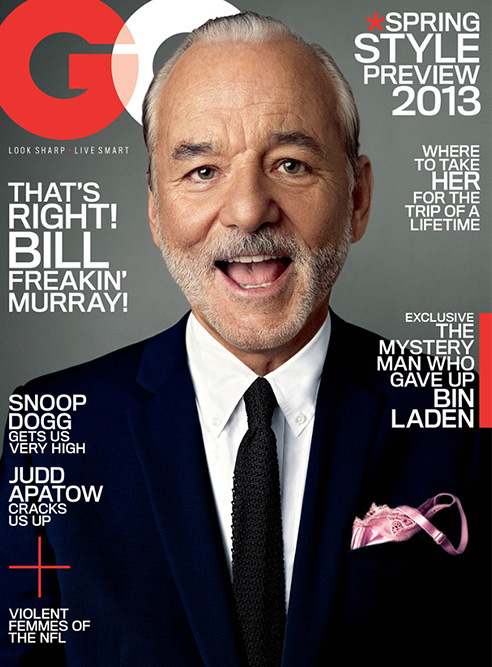 This particular issue had Bill Freakin’ Murray on the cover. I sat down in a chair in his direct eye line, I pulled out the magazine, and just stared at him. For about 60 nervous, anxious, heart pounding seconds, I waited for Mr. Murray to notice my ploy to get his attention. I saw his eyes recognize what I was holding, focus in on the picture and then notice me staring at him, realizing my goal to get his attention. He then stepped back and had a good laugh. He got the attention of the woman and pointed my way. I knew I was in. I walk/ran/sprinted over there, shook his hand and we began to have a conversation. We talked about his picture on the cover of GQ, the article inside, the Charleston comedy scene and my passion to be a comedian. We then parted ways, but not before I invited him to our weekly open mic, and if you’ve heard any stories about Bill Freakin Murray, he just might drop in one of these days. Every moment is a choice. We can choose to say nothing or say something. And if we choose to say something, we can choose to notice our situation and use it to our advantage. Who knows what will happen? You may meet your future spouse, your childhood idol or you might just grow your organization through meaningful relationships. Choose to say something and choose to say the right thing using situational awareness. Have you ever heard that expression “Work smart not hard”? When I work with fraternity men, at least the ones who choose to work at all, they seem to be hard workers when it comes to recruitment. They are planning recruitment events, inviting potential new members to the events, furiously calling and texting their brothers to make sure they are coming to the event, grabbing ice, manning the barbecue pit, talking to guys, GOING CRAZY BECAUSE YOUR CHAPTER BROTHERS ARE EATING ALL THE FREE FOOD AND TALKING TO EACH OTHER. Let’s get smart! My suggestion: Part 1. Stop planning recruitment events. It takes so much time, a lot of money (depending on the event) and requires that all of your brothers pitch in and help out (“I think I just saw a unicorn”). My suggestion: Part 2. Start going to events planned by other people. Every campus has a Campus Activities Council that plans fun and free events for students on their campus. It might be a comedian, a musician, a game show, a video game tournament, a lecture on an interesting topic, or any other event that you probably ignored this semester. The Campus Activities Council is always looking to reach more students with their programming, and you are tired of running yourself ragged by planning and executing your own events. HMMM…! How about you just hitch your wagon to their wheel? Meaning, invite people from the names list, not to your chapter house for the fun event, but to the student union/quad/dorm/auditorium for a free night of fun. Also, you know all of those brotherhood, service, social, philanthropy, your exoteric rituals and intramurals that already fill your calendar? Those are great opportunities to invite people with whom you have a mutual interest. The best way for potential joiners to learn about the organization is by witnessing the organization in a realistic group setting. Rather than standing around on your back deck eating hamburgers and hotdogs, with every member asking every potential new member “Where ya from,” “What’s your major,” “Did you play any sports in high school,” show them what fraternity looks like in a real way. Pretty soon you can stop planning recruitment events, wasting time and money and you’ll be working smart not hard. Why do people join fraternities? Why do people join anything – Fraternities, sororities, church groups, military, sports teams, email chains, cults? There are so many ways to answer this question about people’s motivation to join organizations. However, I feel the best way to simply answer this question is to simply break down what an organization is – PEOPLE and PURPOSE. Joiners usually are signing up, clicking subscribe, pledging their loyalty because of one of these two things. PEOPLE and PURPOSE. Are our chapters recruiting with PEOPLE and PURPOSE? Fraternity and sorority recruitment is most visible when we try to grab the attention of the potential joiners on our campuses. Banners in the student union, sidewalk chalk, A-Frame signs and makeshift bed sheet banners outside of a fraternity house window are just a few manifestations of fraternity and sorority marketing. Is that PEOPLE and PURPOSE? 1. Marketing should help you meet new PEOPLE. 2. Marketing should clarify your PURPOSE to people you already know. During my presentation training, I share the statement, “People join because of PEOPLE and PURPOSE” and everyone in the audience gives an agreeing nod. My guess is that most members of a values based organization would easily agree that PEOPLE and PURPOSE are the answers. But when I walk around college campuses, notice the common recruitment strategies and have conversations about recruitment, I don’t see much of PEOPLE and PURPOSE. We all agree that PEOPLE and PURPOSE is “where it’s at”, but we can be so easily distracted, spending our time/money/focus on everything but PEOPLE and PURPOSE. Power to the PEOPLE… and PURPOSE!